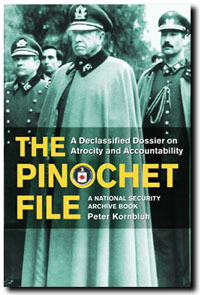 Washington D.C., December 21, 2007 – On the fifteenth anniversary of the discovery of the Archive of Terror in Paraguay, the National Security Archive posted Spanish-language documents that reveal new details of how the Southern Cone military regimes collaborated in hunting down, interrogating, and disappearing hundreds of Latin Americans during the 1970s and 1980s. The collaboration, which became officially known as “Operation Condor,” drew on cross-border kidnapping, secret detention centers, torture, and disappearance of prisoners—rendition, interrogation and detention techniques that some human rights advocates are comparing to those used today in the Bush administration’s counterterrorism campaign. The selection of documents posted today included uncensored records relating to the pivotal case of Chilean Jorge Isaac Fuentes Alarcón and Argentine Amílcar Santucho, who were detained in Paraguay in May 1975, and whose interrogation under torture led to the decision by Chilean secret police chief Manual Contreras to formalize coordination against the left among the Southern Cone military states. One document posted today for the first time is the list of questions created by Argentine intelligence agent José Osvaldo Ribeiro [Alias Rawson] to be used in the interrogation of Santucho and Fuentes Alarcón in Paraguay. Chilean agents subsequently rendered Fuentes Alarcón to a secret detention camp in Santiago from where he was disappeared. 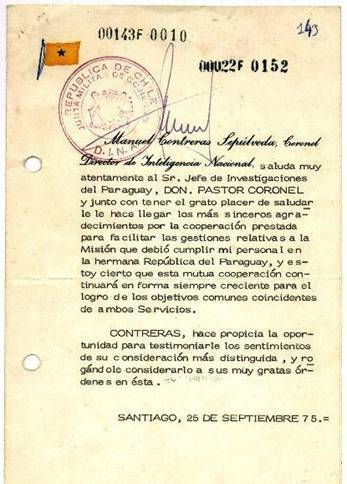 The Archive also posted a “thank you” note to the Paraguayan secret police from Col. Contreras for the handling of Fuentes Alarcón, as well as Contreras’s invitation to, and supplementary documents for, the first Condor meeting in November 1975—documents found several years ago in the Paraguayan Archive that have been widely used in books about Operation Condor. The posting includes communications between “Condor 1” (Chile) and “Condor 4” (Paraguay), records of meetings between the D-2 of the Paraguayan intelligence service, and officials from SIDE (the State Intelligence Service) in Argentina, and SID (the Defense Intelligence Service) in Uruguay, and documents related to the coordinated efforts to capture Montoneros in Asunción in 1980—among other facets of the Condor coordination during the era of military dictatorships in the Southern Cone. "These documents provide a historic passkey into the horror chambers of the Southern Cone military regimes," said Carlos Osorio, who directs the Southern Cone Documentation Project at the National Security Archive. "The atrocities they record from the past remain relevant to the debate over the conduct of counterterrorism operations today and in the future." Since its discovery in December 1992, the Archive of Terror has become a leading source of evidence for international human rights proceedings in courts across the world, as Paraguayan researchers such as Alfredo Boccia Paz, Rosa Palau and Miriam Gonzalez have worked tirelessly to locate and provide documents to lawyers and judges in countries such as Spain, Italy, France, Chile, Argentina and Uruguay. Their book, Es mi informe: los archivos secretos de la policía de Stroessner (This is my Report: the Secret Archives of Stroessner’s Police), first identified some of the most significant documents from this unique collection. Since 1998, the National Security Archive has worked with the Paraguayan Center on Documentation and Archive for the Defense of Human Rights (CDyA) that oversees the Archive of Terror. The National Security Archive has collaborated with the Center to create a fully digitalized collection of more than 300,000 records—the Digital Archive of Terror (ATD). This unique data base, now being posted in sections on the world wide Web, is designed to facilitate ongoing research on human rights crimes, and the discovery of new evidence on the history of state-sponsored terrorism in the Southern Cone. In May 1975, the Paraguayan border police detained Jorge Isaac Fuentes Alarcón, a Chilean courier for the Revolutionary Coordinating Junta, an umbrella group of militant organizations in the Southern Cone, along with an Argentine named Amílcar Santucho. This five-page report by the Investigations Department of the Asunción Police is among the first of many internal records relating to their detention. “Group to investigate,” read the details about detainees numbers 15 and 16: “Amílcar Latino Santucho Juárez, Argentine… Detained on 16-V-75… a leftist Argentine newspaper was found among his belongings … At the authorities’ request, he used the false name of Juan Manuel Montenegro.” And “Jorge Isaac Fuentes Alarcón or Ariel Nodarse Ledesma, Chilean… Detained on 17-V-75… because he was fellow traveler of Amílcar Latino Santucho Juárez.” Santucho, brother of the Argentine guerrilla leader of the Ejército Revolucionario del Pueblo (ERP), would remain in prison in Paraguay for many years, and Fuentes Alarcón, a high ranking leader of the Chilean Movimiento de Izquierda Revolucionaria (MIR), was subjected to torture during interrogation, and then turned over to agents of the Chilean secret police to be transported back to Chile where he was disappeared. Their cases became a study in collaboration among the Southern Cone secret police services, and the catalyst for formalizing that coordination into an official alliance against leftist "subversion" called Operation Condor. Alerted by the Paraguayans, the Southern Cone intelligence agencies began participating in the interrogation of Santucho and Fuentes Alarcón. 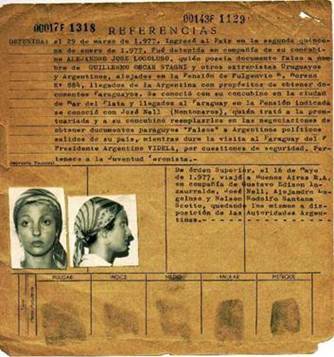 In these two documents, Argentine intelligence agent José Osvaldo Ribeiro [aka Rawson] lists a series of questions to interrogate Santucho (referred to as "Alicia" in the documents) and Fuentes Alarcón (referred to as "Nene"). The interrogation is aimed at obtaining information on the strength and activities of the Revolutionary Coordinating Junta (JCR), a coalition of the guerrillas of the Chilean MIR, the Argentine ERP, the Uruguayan MLN-Tupamaros and the Bolivian ELN. The intelligence agent requests that Santucho “Clarifies the reason of his trip…But without any lies – So far he has lied all the time and has prolonged the investigation…What was his position within the JCR?” Regarding Nene, Rawson demands: “Since when does he know Patricio Antonio Biedma? What was Biedma’s role within the JCR?” A Chilean, Biedma, was disappeared after being secretly held at the clandestine detention center Automotores Orletti in Buenos Aires in 1976. During the harsh interrogations of Fuentes Alarcon and Santucho in Paraguay, a high ranking intelligence officer received a "package as a gift" from a very high ranking Argentine officer, Brigadier General Otto Carlos Paladino. General Paladino, according to this document, also sends "pictures of Illich Ramírez Sanchez (Carlos).” It is known that Santucho and Fuentes Alarcón were interrogated about their links to international terrorists, in particular Carlos. Within a year, Paladino is promoted to head SIDE, Argentina's State Intelligence Service, and directs the infamous clandestine torture center in Buenos Aires, Automotores Orletti. Along with Contreras’ invitation came an eleven-page agenda for the first working meeting of what is known as Operation Condor. Matters to be discussed by military invitees from Argentina, Chile, Bolivia, Brazil, Paraguay and Uruguay, included establishing "an efficient coordination that would permit a timely exchange of information and experience….” According to the analysis in the document, “Subversion has developed centralized continental, regional and sub-regional commands to coordinate activities." For that reason, the Southern Cone secret police services needed their own system of centralized coordination. This transmission, one of several found in the Archive of Terror, provided evidence of how Condor nations communicated. The Paraguayan Ministry of Interior received this cable in which Condor 1 [Chilean DINA] informed Condor 4 [Paraguayan Intelligence] about the capture of a Paraguayan student in Corrientes, Argentina. Once the Operation Condor communication system was in place; its members exchanged cables using the Condor labels. 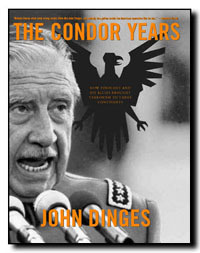 As journalist John Dinges points in his book, The Condor Years, the labels assigned to the intelligence agencies were: Condor one (Chile), Condor two (Argentina), Condor three (Uruguay), Condor four (Paraguay), and Condor five (Bolivia). Since Chile provided the information center for Operation Condor, the DINA received information from one country and would forward it to another. This document, a request for intelligence from other Condor nations, provides further evidence of how the Condor nations collaborated. In this case, the Chief of the Second Department [Intelligence] of the Paraguayan Army Chiefs of Staff, Benito Guanes Serrano, issued a search request addressed among others to Condor 1 and SIE (Argentine Army Intelligence Service - Servicio de Inteligencia del Ejército) requesting information about a guerrilla movement in Paraguay that has been detected by the Argentine Intelligence. This heart wrenching note, handwritten by Dora Marta Landi a few days before being disappeared, was found by Paraguayan researchers among the files relating to her detention. "Mr. Director," she writes, presumably to Alberto Cantero. “When I talked to you I forgot to mention the following. I think it would be helpful to clarify the issue of the documentation, for you to talk to my husband’s parents. To that effect, it will suffice that you allow us to make a call or send a letter asking them to come here. If they have not shown up yet, I think it is because they do not know we are here… I thank you immensely for having listened to me and I apologize for my insistence.” Her own parents, and those of her husband, searched for them in vain for years..
Horacio Campiglia (aka Petrus) disappeared in early 1980. Twenty-two years later, declassified U.S. documents confirmed that he had been captured by an Argentine secret police squad in Rio de Janeiro, Brazil, and rendered to the Campo de Mayo Clandestine Detention Center in Buenos Aires, Argentina. His sister had disappeared earlier. Although her body was later recovered, these documents have provided the first concrete evidence that the security forces were responsible for her death.